At Last You've Arrived! 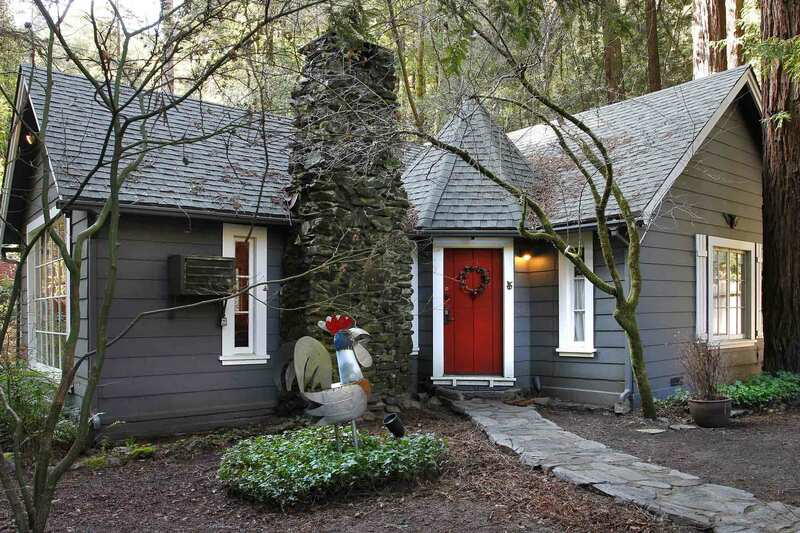 Fairytale Luxury Cottage on Half Acre under Towering Redwoods, Designer Furnishings, Central Heat, Gas Fireplace, Hot Tub, Large Fenced Yard. Easy Outing to Downtown Guerneville, River Beaches, Wine Tasting, Golf. Wi-Fi, Landline Phone, Cable TV. Keyless Entry. Your Well-Behaved Dog is Welcome! At Last's living room opens to a separate kitchen with eat-in dining. The kitchen opens to a dining patio with steps to the yard. Off the living room, there's a short hall with two bedrooms and a full bath. There's a detached garage with an additional bathroom, laundry, and foosball table. 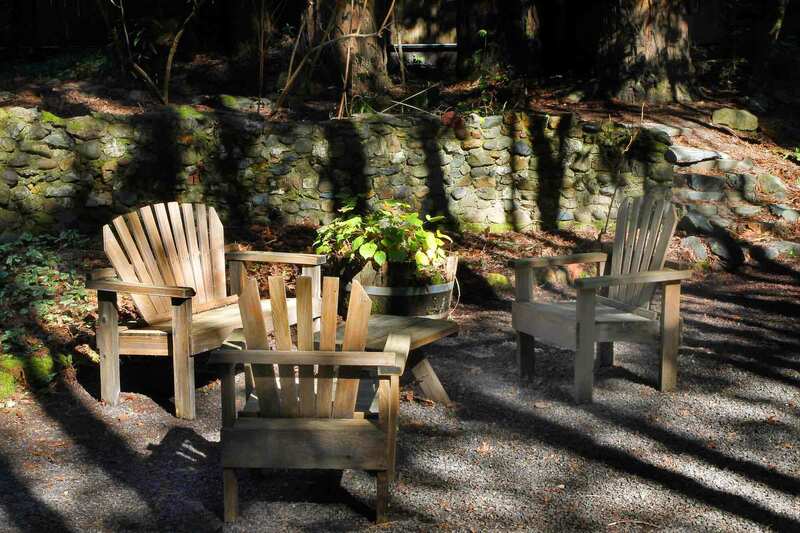 The fenced yard is wooded, with outdoor dining area and hot tub on its own deck. Hulbert Creek runs next to property; there is no direct access from the house. House is approx. 1000sf. Note woodstove in photos is not working. Maximum Occupancy: 6. Max Automobiles: 3. Quiet Hours 10pm-7am. No outdoor amplified sound at any time. *Note: One bathroom is in detached garage. Great stay at a wood home with a beautiful hot tub and kitchen table. Recommended for sure.
" Thank you so much for hosting me and my friends!" This is a very exclusive place, very relaxing, and better than I expected. It was very clean and welcoming when we came. There really is no service until you’re connected to the WiFi, so just be sure to write down/screen shot the door code. Everything was amazing, and I would definitely stay here again. Thank you so much for hosting me and my friends! "The hot tub is such a perk!" Its a beautiful home, we were there during a weekend it rained and the home was so cozy, and comfortable. The hot tub is such a perk! Did I mentioned it felt magical with the rain and the creek running and the beautiful redwood trees surrounding the home. it was gorgeous! "It was a great Airbnb experience!" This place is amazing- we spent a weekend here with 5 friends and it was such a gorgeous getaway. The house is sparkling clean and so cozy, and feels isolated in the woods. 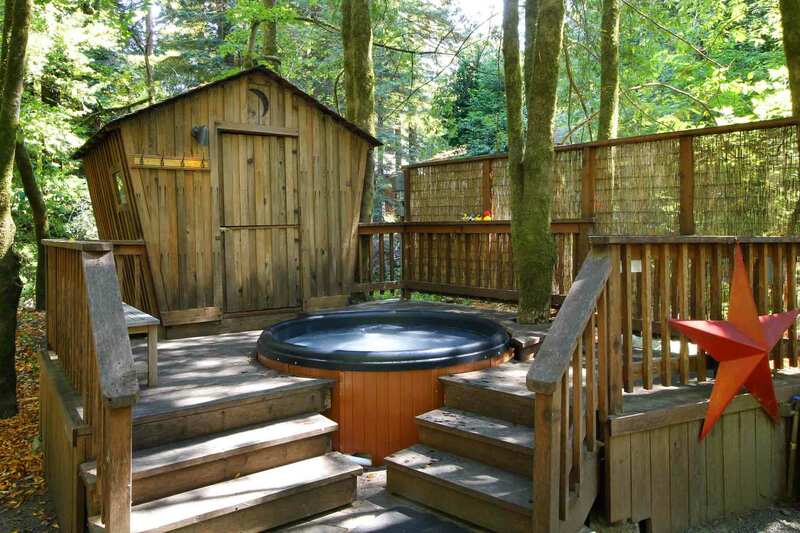 The hot tub was really nice under the trees, and overall we really loved the place and would definitely visit again. The kitchen is large and well-stocked, the living room was really cozy and nice (although the fireplace was out of commission when we were staying, they said it was awaiting a cleaning) and there was a lot to do nearby! We went hiking in Armstrong Woods and wine tasting in Healdburg, as well as cooking some great meals at home and hanging out in the house. It was a great Airbnb experience! "Everything we expected & more! " At Last was everything we expected & more! 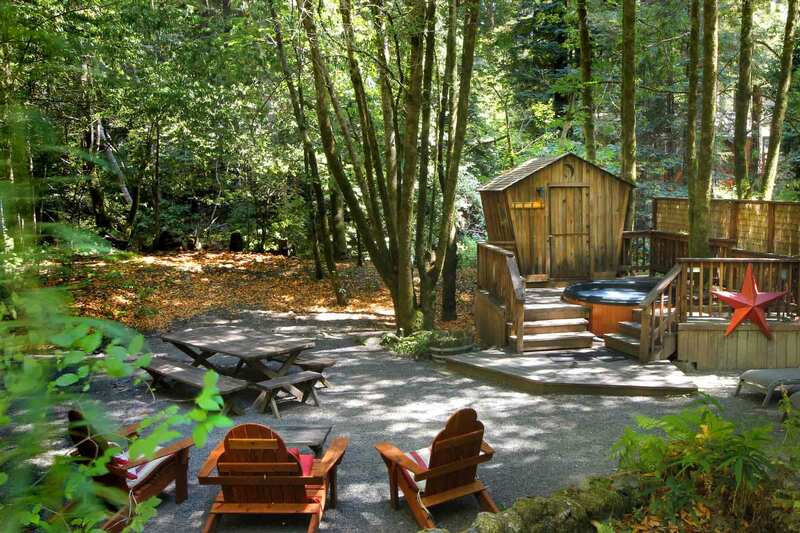 Starting the day off with a morning soak in the jacuzzi surrounded by the beautiful redwoods was just what we needed. The kitchen was equipped with everything needed for simple meals accompanied with exceptional wines gathered from time spent tasting at the nearby wineries. Already looking forward to our next visit! "yard is the selling point"
Well, I wrote this in previously, but the woodstove didn't work. I think it needed a chimney sweep, but it also only had an air intake valve and no outtake, and their handyman had no idea how it worked. that was the only issue. Other than that, 5 stars - hot tub was amazing and we were in it ALL THE TIME. Backyard was our own private oasis. Would definitely book again if they got the woodstove working properly! House is amazing beautiful, but the yard is the selling point. We cooked all our meals there, so bring a serrated knife if you use one! Other than that, well stocked. "plumbing issues but otherwise the property was great"
We had some plumbing issues but otherwise the property was great, and hosts were accommodating with a partial refund following our stay due to the plumbing issues. "great spot for a relaxing weekend"
This is a great spot for a relaxing weekend. The location is central to a few different beaches as well as downtown Guerneville, yet feels secluded amongst the Redwoods. The house is well furnished and I was especially impressed by how well stocked the kitchen was with all the equipment we needed to cook for the weekend. The first morning we discovered the shower knob had come loose and would not turn on. Once we called management, a handyman was out within the hour to quickly take care of it. I would definitely come back here again! "Already can't wait for our next visit!" We love At Last! This was our second time staying at this lovely little cottage in the woods and it was just as great as last time! 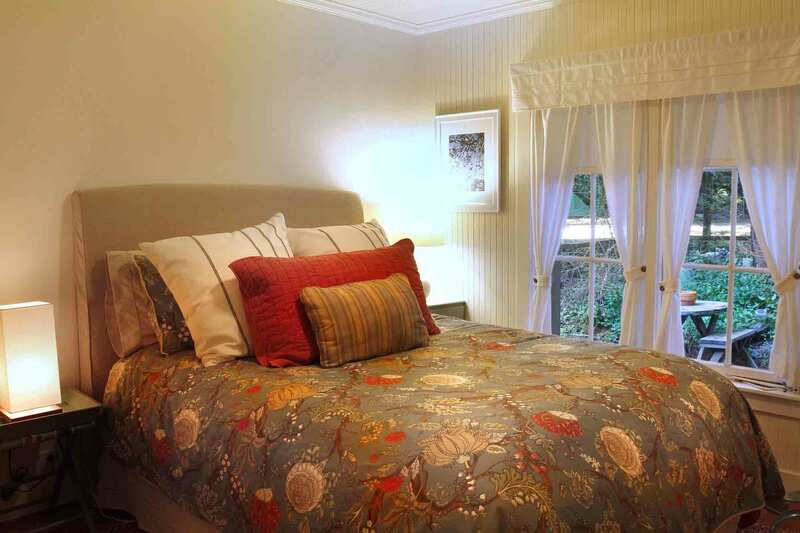 Both times it has been exceptionally clean, with nice, comfy beds and pillows. The backyard is exceptionally beautiful and peaceful with plenty of space for the kids to play. The fact that it is completely fenced in makes it extra relaxing for the parents! The folks at Russian River Getaways are consistently friendly and quick to respond to all questions and needs. Already can't wait for our next visit! This space is set beautifully among redwood trees. It's very quiet and private. The hot tub is amazing and such a nice touch. There's lots of room for a family to stay here. This house is also VERY well stocked with kitchen and bath supplies, which we thought was great. It was easy to find and all around very enjoyable.
" incredibly cozy and warm"
This place was incredibly cozy and warm. All-wooden interior felt intimate and rustic. The kitchen was very well-appointed, we had every cooking implement we could ask for. The wooden deck and hot tub offered great settings for conversation. Many memories were made here, can't wait to return!
" 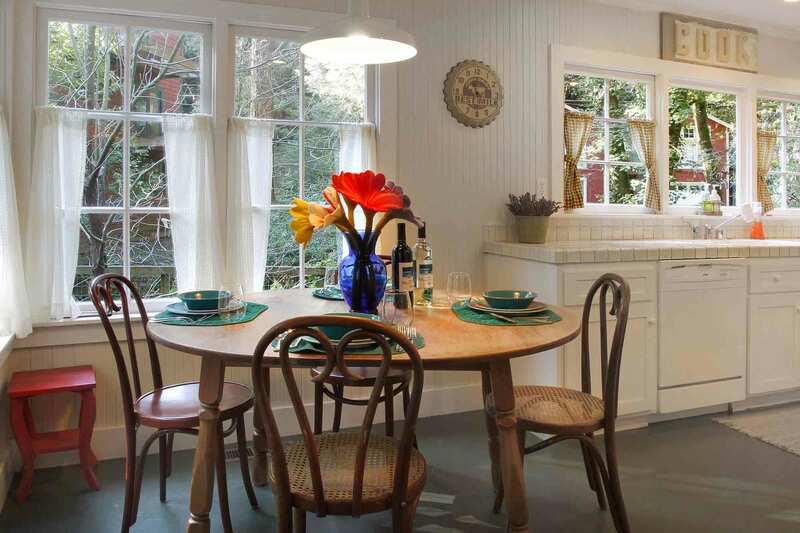 Great kitchen space to cook in "
Amazing place nestled among the redwoods with all amenities thought of. Great kitchen space to cook in and the hot tub was such a treat. 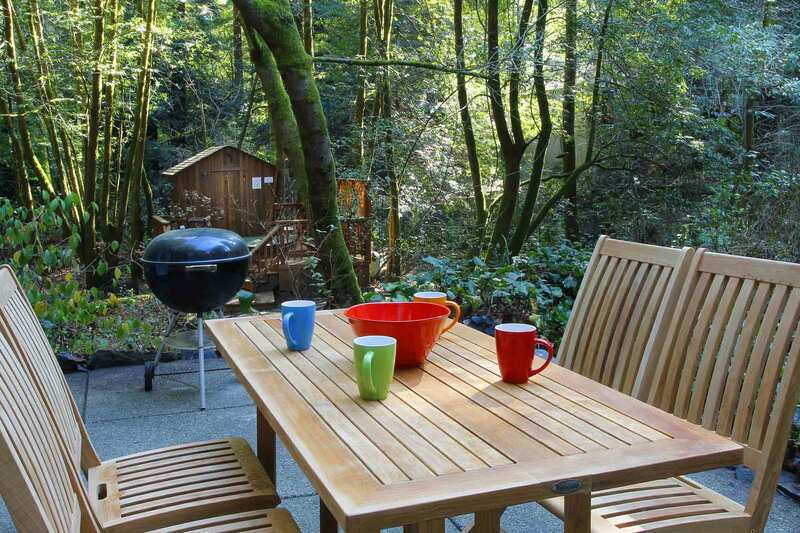 Guerneville town center with its restaurants and shops was a short drive or an easy walk away. Would recommend to anyone contemplating a visit to the Russian River.
" The property is absolutely gorgeous"
We enjoyed our stay at this beautiful cabin. Despite being on a road with a lot of houses, it is near the end and feels very private and secluded. The property is absolutely gorgeous and convenient to town. We especially loved the outdoor area / hot tub. Thank you! "Very quiet and relaxing stay! " 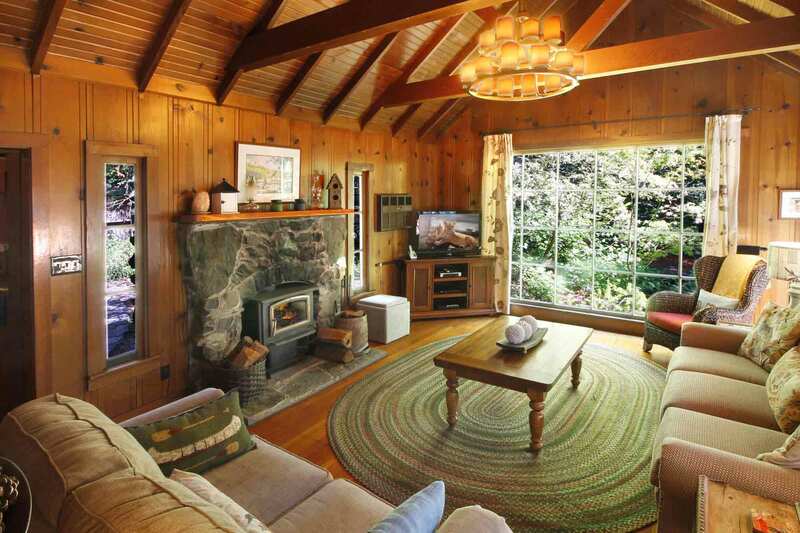 We really enjoyed the cozy knotty-pine-walled living room with its stone fireplace and well-stocked library. Were happy as clams BBQ-ing on the patio and enjoying al fresco dining among the shady trees. Played guitar sitting on the picnic table in the immense wooded yard. Less than a 10 min drive into Guerneville with its Safeway, shops and eateries. Would certainly stay here again. fantastic outdoor space and lovely home. "Nice little cabin in the woods"
Nice little cabin in the woods. Great selection of games and books. Hot tub was nice. Kitchen fully stocked. The Apple docking station isn’t compatible with any newer devices. Would recommend bringing your own portable speaker if music is important to you. 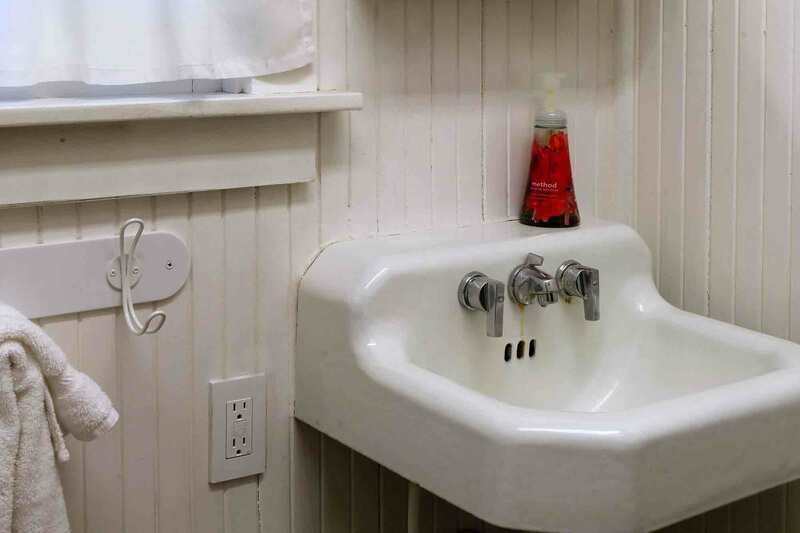 Would also note that “second” bathroom and foos ball table are located in a musty outbuilding that isn’t exactly somewhere you will want to spend a lot of time..
"This little cottage was an absolute dream..."
This little cottage was an absolute dream for our quiet girls weekend. The setting is beautiful and serene, very private and a perfect backdrop for me to re-connect with my best friends. The kitchen is well equipped and allowed us to do some cooking, but the location is also convenient to nearby restaurants. I would definitely stay here again! Perfect spot. Peaceful. Perfect location. Centric. Beautiful details. Lots of books and games. Lovely private quiet cottage. Kitchen is bright and cheery. Main room is cozy. Beds are comfy. Quick trip to town. Hot tub fabulous. Grounds are enchanting. All in all good stay, and would recommend. This is the 4th time we have rented in the area, 3rd at this location. 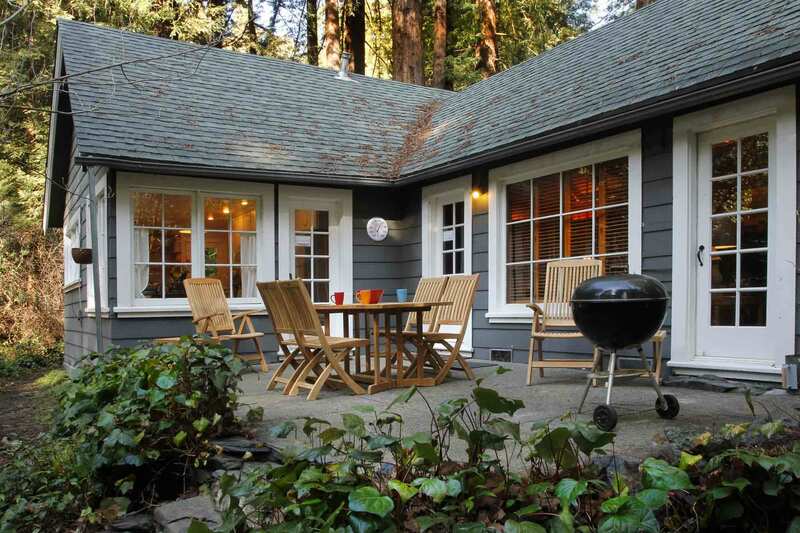 Guerneville is a great resting place with easy day drives to the coast, wineries, State Parks and local brew houses. Home is well equipped, extremely comfortable and peaceful. Enjoyed our stay! Homey, clean and a large lot next to a creek. Everything worked well, from the wood stove to the gas bbq grill. The 2nd bathroom and foosball table are both in a detached garage/loft which was a bit cold and dark during our stay in March. Easy check-in and great communication with hosts. Would happily stay here again. "The place is even better in person!" The place is even better in person! We absolutely loved our stay. The house had everything in the description and more. Close to grocery store and little town area. Lots of hiking trails too. "What a marvelous and magical place!" What a marvelous and magical place! We had a girls weekend at this beautiful getaway. It was fabulous! Very clean, great kitchen, and River Getaways communicated very quickly with us about any questions we had. I highly recommend this place!!!! Our family spent 3 nights in "At Last". That was a great and confortable stay. It is easy and very well adapted to youngers (kids from 1 to 5) as to olders. Everyone had relaxing time. We made use of the kitchen and the fire place and both were great and fully functional. I recommend this place, with no reserve. "The cabin was a wonderful..."
The cabin was a wonderful and relaxing getaway for myself and friends. The photos really don't do it justice. It was comfortable and cozy for 6 people. 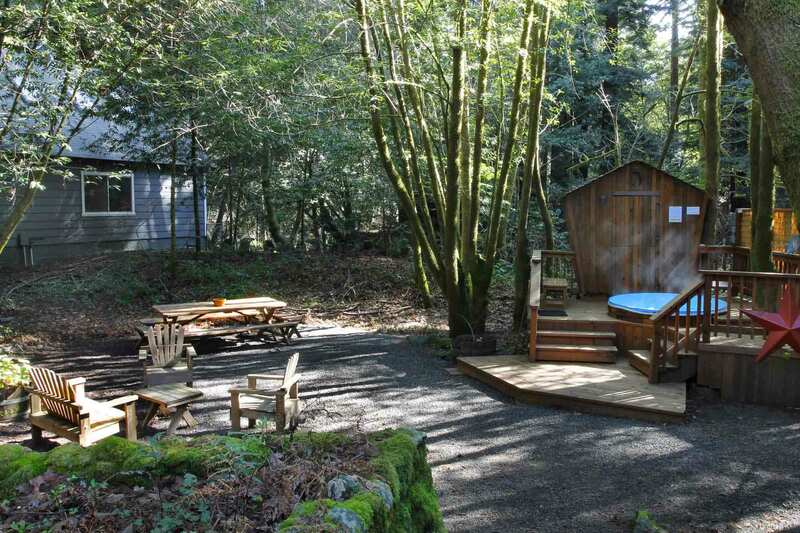 The yard is HUGE with creek views and the hot tub in the forest was wonderful. All the beds (even pull out sofa) were comfy for guests. The kitchen was well-stocked so we had no trouble cooking every meal at the house. Lovely neighborhood. So peaceful. Easy check in. Loved our stay! Beautiful cabin, and as other reviewers have noted, the pictures don't quite make it justice. The living room is particularly comfortable, and the fire place is a nice touch. 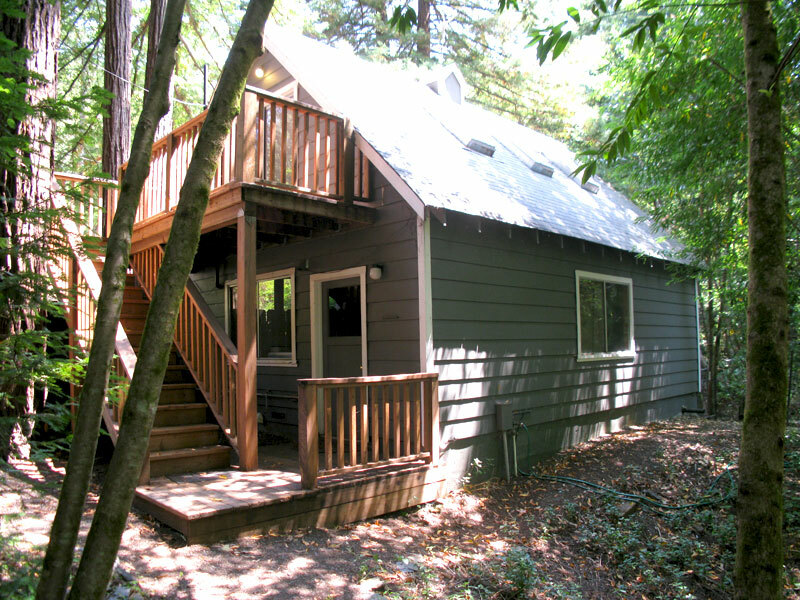 Despite being less than 10 minutes away from Guerneville, the place feels remote and relaxing. "Very charming property. 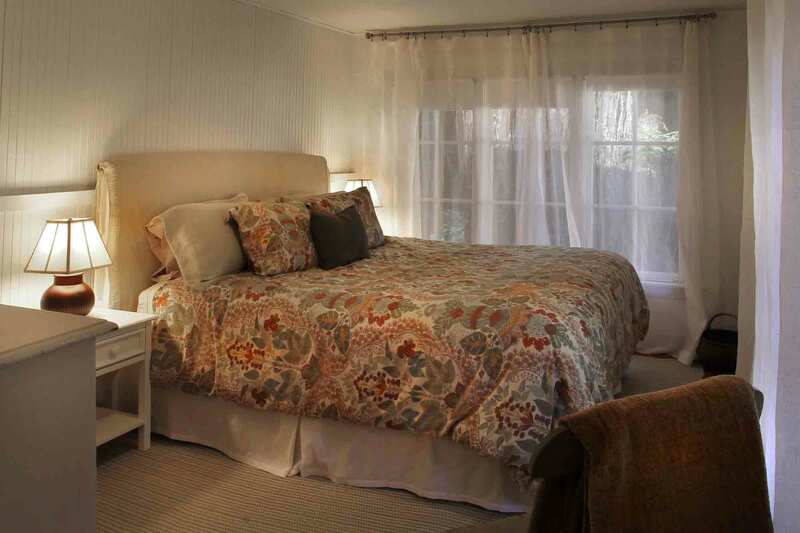 Comfortable, clean and peaceful." Cozy two bedroom with a wood burning stove-great ambiance. Lists as two bath but one is out in the garage soooooo that was a little disappointing. Great kitchen with everything you need. Would totally stay again. Definitely recommend this rental as it had everything we needed for our vacation. The hot tub was heated and ready to go for us. The home was clean and cozy with every amenity you would need to cook for the holidays and curl up near the fire place. The beds were also very comfortable, so we rested really well. we loved our stay at "at last". it was warm, cozy and everything we could have wanted. Accommodations were great! Nice old cottage with a lot of personality! "The house was super cozy..."
The house was super cozy and exactly what we wanted in a low-key weekend. The backyard was especially beautiful with the fall colors. The kitchen was well-stocked with cooking utensils and the hot tub and grill worked great. Would definitely return! Thanks for the review and feedback on At Last, Kate! We do hope you will be back soon. "Perfect spot for our family"
What a sweet little property. It reminded us of a little fairytale cottage. The grounds are fabulous for hide and seek and overall freedom for the kiddos. We have a 5.5 and 2.5 yr old and the boys were in heaven. Kitchen was nicely appointed. My 5 year old is already asking to return. "At Last is a slice of magical heaven"
At Last is a slice of magical heaven. The redwoods on the property were so very healing. This was a perfect location for my family and our small dogs. We had everything we could possibly need for our 5 night stay. The hot tub was working just fine too. I tried to be extra cleanly so I can come back : ) I did all but one load of sheets, towels etc but it was not expected. I can NOT wait to come back here next year. I absolutely fell in love with Guerneville. "Nice accommodations in a lovely location"
Nice accommodations in a lovely location. A large backyard facing a pretty creek. A very well managed property in a quiet street only a short drive (7 minutes) to downtown Guerneville. Thanks for the great review Arik! You're welcome back any time! "Quaint cottage in the woods"
We enjoyed our stay...great area with lots to see and do. Nice place. Could use some updates. One bedroom door was missing the latch to close it. The hot tub didn't work. 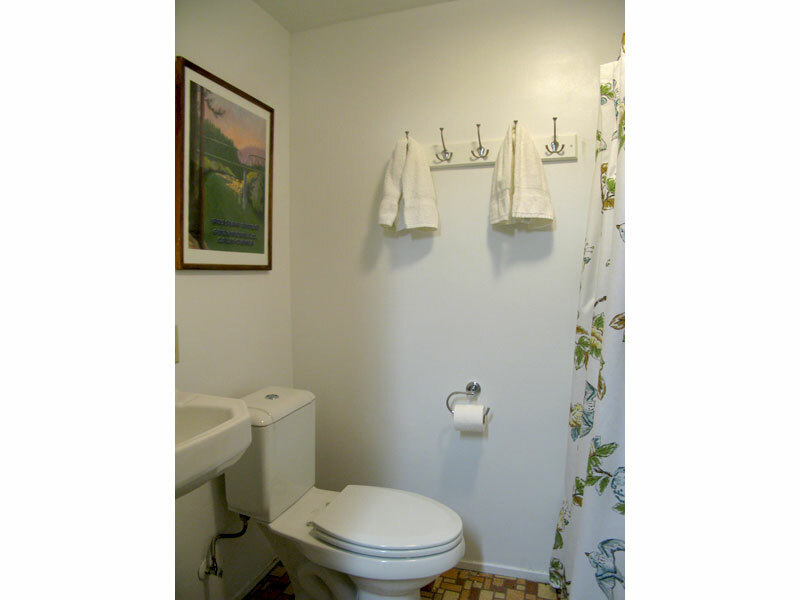 Bathroom noises can be heard in both bedrooms as the walls are nearly paper thin. Would rent again but not with another couple. Thanks for the review and feedback Craig. We'll take a look at the door latch. Next time, if you let us know something like the hot tub is not working, we can usually get it fixed lickety split. Awesome house and plenty room to kick back and relaxe. Great communication. Wonderful property. Would definitely recommend. "The house and grounds were beautiful"
The house and grounds were beautiful. Had my grandbabies with who are 2 and 4 and they were able to run around the fully fenced property. The house was equipped with everything we needed. The only negative was the bedding for the sofa sleeper was awful. One set of sheets were dirty and the second set ripped. We did not use it. Everything else was perfect and I can't wait to go back. "This house is charming and clean"
This house is charming and clean. It fit two families with two small children (ages 4 and 6) and two babies under 1 comfortably. We were very happy with the kitchen it was fully stocked and we were able to prepare and serve a meal to 4 adults and 2 kids. It was a nice weekend. Quite a drive to wine tasting but the kids just loved the house. "At Last is a gorgeous, cozy cabin..."
At Last is a gorgeous, cozy cabin that was perfect for our ladies weekend getaway. The living room with the large window overlooking the yard, rustic chandelier and fireplace was perfect for playing games and reading. 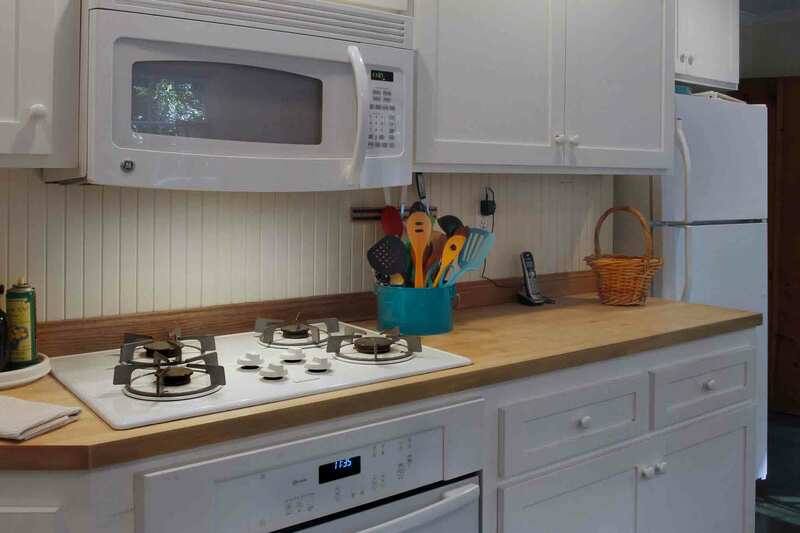 The kitchen is well equipped for meal preparation as well as an additional gathering area. The hot tub was lovely and easy to use. If it had been warmer outside, we surely would have enjoyed the back patio and grill. Quick drive to downtown Guerneville and only about 25 minute drive to the coast where we saw a beautiful sunset. Easy check-in: having a door code to avoid key pickup/drop off was perfect since we arrived late out fist night. Would love to stay at At Last again! Perfect for a group of friends, a family, or even a romantic getaway! "Perfect location for a relaxing getaway!" We were impressed from the moment we arrived! 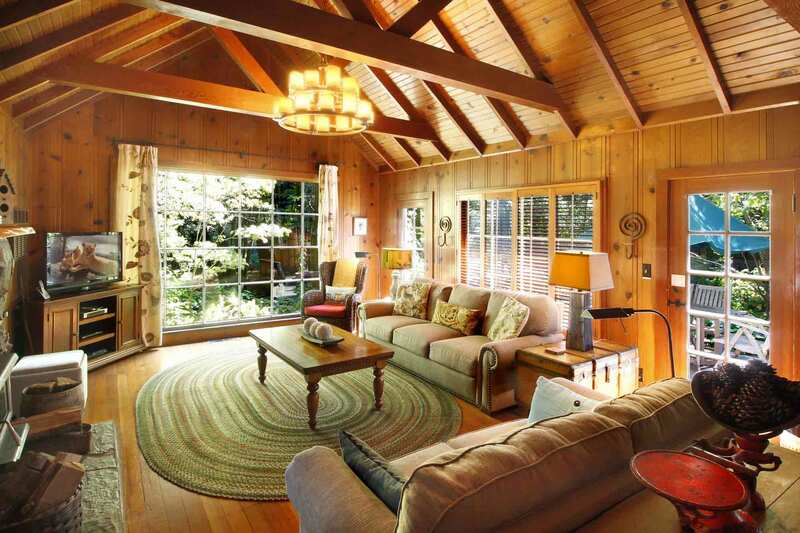 Beautifully located and surrounded by tall redwoods. House was clean and kitchen well equipped. We enjoyed the fire and the large picture window that overlooked the trees and hot tub, with roaring creek on the property boundary. We will definitely visit again! "Beautiful place right next to a creek! " Beautiful place right next to a creek! The town and the redwood park are both just short drives away. Perfect for a long weekend getaway. Wow!! 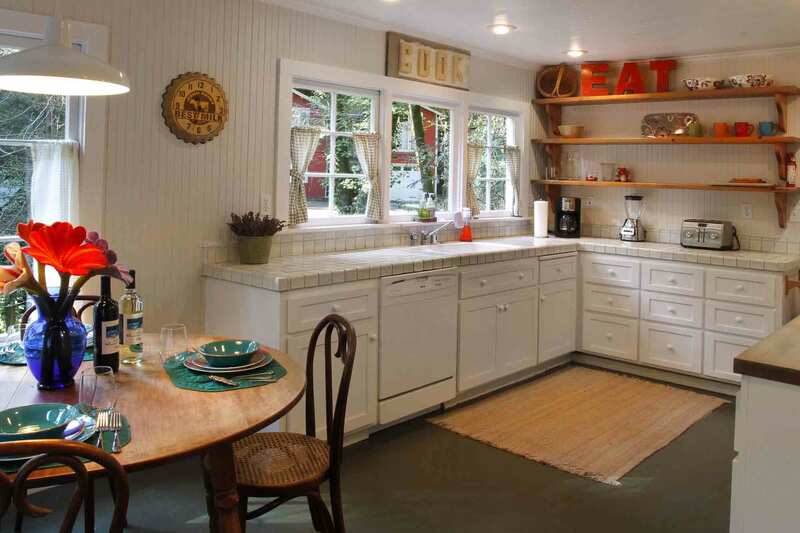 This classic cottage was more than we expected. As a carpenter and woodworker, I was really impressed with the quaint details through-out. The fenced in yard was a huge bonus for our four-legged fur baby too.. Nice amenities, modern kitchen fixtures, with ample room to entertain without being on top of each other. It easily and comfortably hosted two couples, a baby, and a dog.. We'll definitely be back! Great, secluded cottage true to photos and exactly as described. A few things to note: they do not supply firewood so be sure to pick some up at Safeway before arriving; laundry and the second bathroom is in the detached garage; if you plan to cook bring your own basics-no condiments, olive oil, coffee or honey are in the cottage. They provide a few basic spices, mostly for grilling. Well appointed kitchen has all other supplies, even a blender. The cottage is located on a large piece of land with a small stream running along the length of the property line. Even though other homes are located close by, the cottage feels remote. With beautiful redwoods on the property and a well laid out backyard it's plenty relaxing and picturesque. Would definitely stay here again. "Wonderful Retreat in the Redwoods"
I Loved this little House at First Sight, it was adorable, Clean, Quiet and had everything we needed. The beds were Comfortable and the Fenced Yard gave us a quiet retreat. Yes, I would recommend it to anyone and a few of my Friends asked about how they could stay here too! "Great house with Great Service"
The cabin was a very nice place to stay, but we were charged a cleaning fee and then it seemed we did most of the cleaning ourselves. So the cleaning fee should be returned, we put out the trash can for pick-up, we removed all trash from cans in the cabin, we washed the dishes and the laundry...so what does the fee cover? Thank you for the review. We're glad you enjoyed your stay at At Last. Our professional cleaning staff performs a full clean of each home after each guest, which results in the high level of cleanliness guests enjoy upon arrival. We do ask that guests not leave dirty dishes out and trash in the house, so as not to attract pests. Laundering linens is part of the cleaning service. At Last was just the ideal place we were looking for to spend some quality time with each other &amp; our 2 Jack Russell Terriers. The grounds were so serene and the fencing proved very secure for our 2 girls. They really enjoyed thoroughly exploring every inch of the property. The only negative I can say is that when we arrived the house was very hot inside. It took a couple of hours for it to cool down once we turned on the a/c &amp; ceiling fans. I think it would make the air flow more efficiently if there was also a ceiling fan in the living room. We will definitely be coming back to At Last again. A wonderful spot - quiet and private.We only needed the main cabin. It was charming and even nicer than we expected. The outside areas were just as nice. The property was ompletely fenced for privacy and for keeping our dog safe. Can't imagine another cabin in the area being any nicer than this one. I am in love with this place! Perfect in every way. We brought our min pin and the fenced in yard was perfect for him - he was in heaven! Lovely property with everything you could ever want. We cannot wait to go back! My wife and I wanted to take our 3 dogs on a holiday trip just after Christmas, and we fortunately found at last available for our dates. 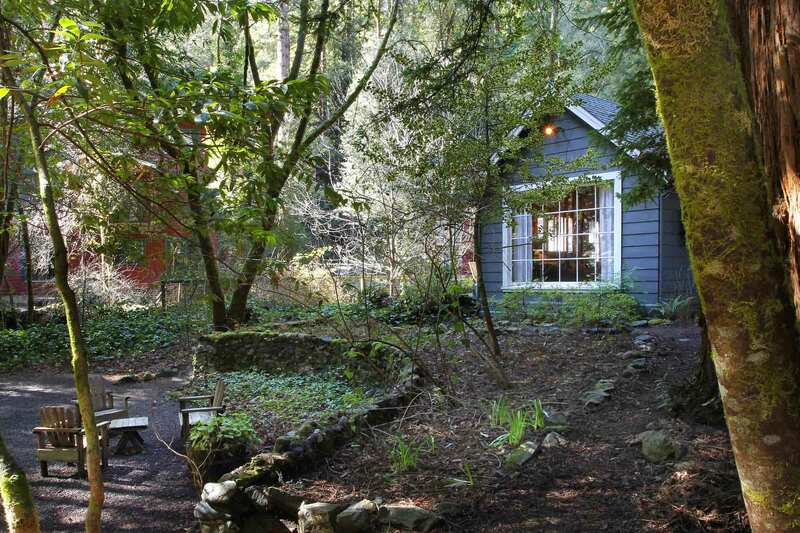 Nestled in a dense thicket of glorious redwoods, we fell in love with the house on first sight. We felt as though we'd stepped into a Thomas Kinkade painting. The dogs loved exploring the grounds (well fenced), and the interior, and we loved the artistic touches in the interior design. We were using the trip as a writing retreat and felt very inspired. The one complaint, while the central heating kept the bedrooms at a nice temp, it made little impact on the living room. The fireplace helped, but be prepared to bundle up on a cold night. We definitely hope to return again, ideally in the summer to take advantage of the Russian River. To note, California is experiencing one of the worst droughts on record so far in 2014, so the river and creeks are incredibly low right now. That said, the redwoods remain as gorgeous as ever and great wine still flows in the valley. "House Fabulous but Lots of Management Restrictions"
The house is very comfortable but if you're coming in winter, it's hard to heat. Plan on a fire in the wood stove but you need to provide your own materials for it. Kitchen is nicely equipped with plenty of dishes &amp; utensils. If you drink coffee, there is a coffee maker but be sure you bring your own coffee. The beds are very comfortable &amp; plenty of covers to keep warm. The views of the redwoods are spectacular but because you're in the middle of them, the house doesn't get much sunlight; it's worth the sacrifice, though. Be sure to read carefully all the do's and don't's &amp; make sure you can live with all the rules &amp; regulations. This would be true for all properties managed by Russian River Getaways. The property is truly wonderful but we did feel that all the rules took away from our full enjoyment. We loved this little cottage, and found it story book perfect! The decor was tasteful and fresh - patio and surrounding grounds are well landscaped. Bathrooms/bedrooms/kitchen have very fanciful artwork, and the kitchen is well stocked w/good cooking pots and pans. A lovely fireplace (and strong central heating) for cold nights. It's nice to have found a place "at last" that we can look forward to returning for a longer stay in the future. 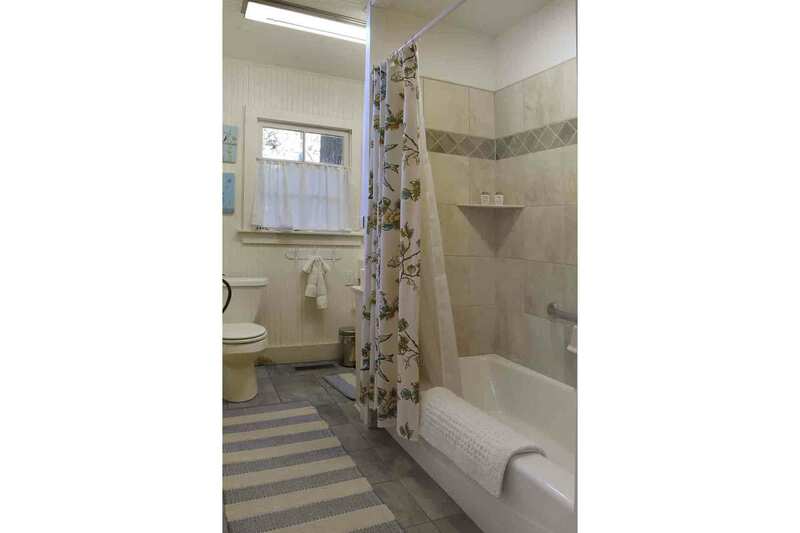 "Should be listed as a one bathroom"
The second bathroom comes with the rental of additional space in the garage. I suppose you can use the bathroom but the hot water is turned off and there are no instructions for, turning it on. Cute place but we could have used a second bathroom as listed. We love this location! 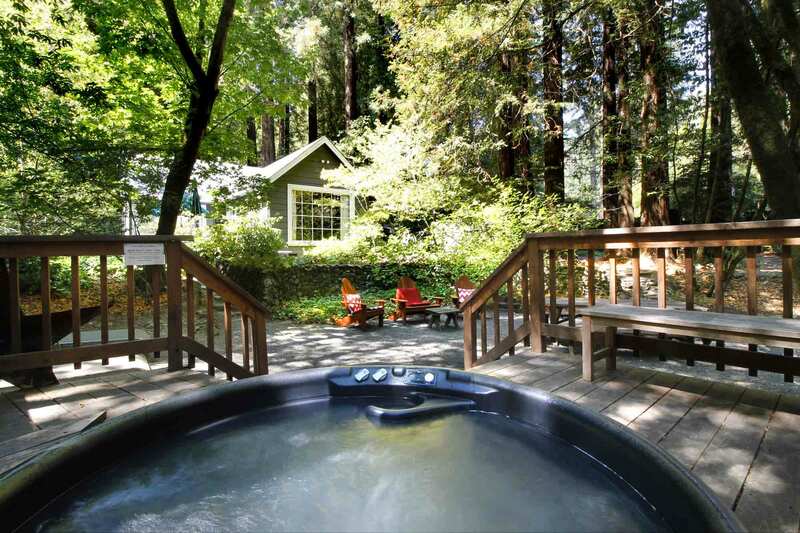 It is the second time we have rented from Russian River Getaways and both times have been in Guerneville. 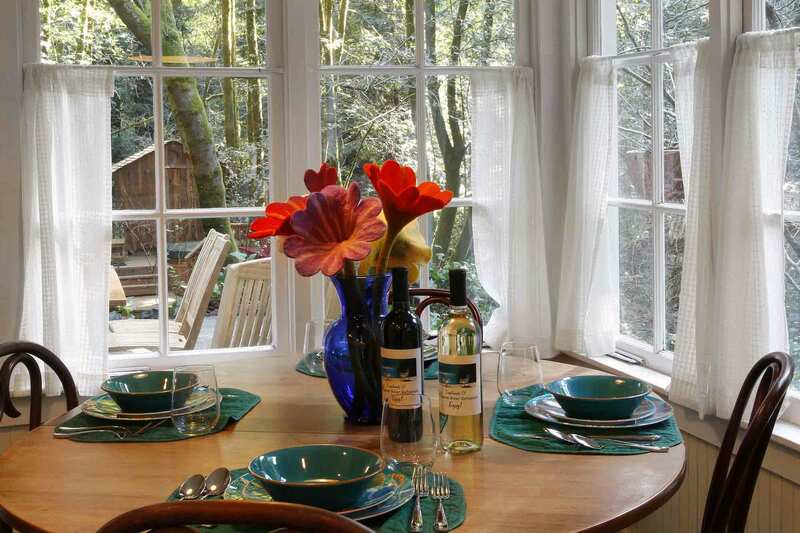 The town is convenient to the coastline, redwoods, farmer's markets and wine country. The home itself is very comfortable, fully stocked and has an incredible yard/outdoor area. Lots of construction in the area during the day, but all work and noise started after 9am. The only disappointing thing was the cleanliness of the home - pots and pans, kitchen utensils were very dirty, floor rugs were stained and filthy. We ended up rolling them up to get them out of the way. There was also a full ashtray of cigarette butts on the patio that was left from a previous renter. What a great name for this very clean and confortable little home. ( 2 Bedroom , 1 Bath) The next time we are in the area, you can be sure we will want to stay in this same home. Loved the backyard and the fact that it was completely fenced. Downside is the parking but that was not a big problem. At Last is truly a relaxing and charming little cabin in the woods. Out here we're all used to parking out on the road and don't even notice that it can be an inconvenience! We're very happy you had a great time! My Mother, two sisters and I arrived early evening after a fairly long drive and were so enchanted with this beautiful cottage (and impressed with how well stocked it was) that we decided to eat dinner there rather than going out. The kitchen, the living room (and the well stocked bookshelves) and the beds were all just perfect. The second night there I even used the hot tub (I like it really hot and it was at a rather conservative temp, but that is more me than the tub)The owners have done everything to make it feel more like being invited to their home than visiting a rental. Once you're inside the fence you feel as if nothing else exists and you have arrived home at last! We're so happy your stay was enjoyed by you and your family and we hope to see you again soon. My family and I rented at Last for a quick weekend getaway. 3 adults, our 2.5 year old and 1 year old. It was perfect in every way! The furnishings are tasteful yet surprisingly child friendly. The kitchen had everything we needed for baking and cooking. The laundry facilities were clean and easy to access.The best part of at Last though is the gorgeous outdoor area! It is like something out of a storybook. We arrived late the first night and found the home easily, but were delighted to be welcomed by lights on the fence and spotlights on a few grand redwoods in the yard. It was a magical welcome! We enjoyed the outdoor sitting area in the sunken entertainment area, along with the large picnic table under the shade of the forest overhead. It was easily 15 degrees cooler in the shady sitting areas. The hot tub was well kept and very easy to access. We took several dips in the hot tub during our visit.We loved walking around the property in the mornings looking at bugs, trees, animals, birds, and the river just steps away (but safely fenced off access). Our 2 days here were so relaxing it felt Iike we had been on a week long getaway! I already want to plan our next trip to at Last!